Since the Army rolled out the AtHoc mass-warning notification system earlier this year, the message for users has been clear: Register now. It takes just five minutes and is the best way to ensure you and your family receive emergency warnings. What may be unclear to users is how to register. To assist, USAG Bavaria’s emergency management office answers some FAQs. 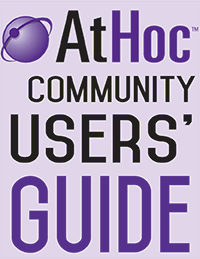 What does AtHoc do anyway? The AtHoc mass-warning notification system sends registered users emergency warnings and other critical information, such as hazardous road conditions, reporting delays, and base closures due to severe weather or other hazards and threats. The notifications are mostly local, but may also be theater-wide. AtHoc is not optional. It is a Headquarter Department of the Army (HQDA) requirement to be a registered user. Who are these users you keep talking about? Who must register? HQDA recently defined the primary AtHoc population as U.S. Military, U.S. Civilians (all categories), and U.S. Contractors whose normal place of duty is on a department of the Army garrison, installation, community, forward site, and/or facility. Primary population personnel are considered registered users after entering all required basic information (first name; last name; rank/grade; primary duty location; organizational hierarchy; duty status, and include alerts from), all on-duty contact information (work phone, work email), and at least one off-duty contact device (phone and/or phone with text). Additionally, all tertiary personnel must also register in AtHoc. This includes non-U.S. military, non-U.S. civilians (all categories), and non-U.S. contractors whose normal place of duty is on a department of the Army garrison, installation, community, forward site, and/or facility. Tertiary population personnel are considered registered users after entering all required basic information (first name; last name; rank/grade; primary duty location; organizational hierarchy; duty status, and include alerts from), and all on-duty contact information (work phone, work email). They are encouraged and supported to register at least one off-duty contact device (phone and/or phone with text). Okay, I’m a member of the primary / tertiary population. How do I register? If you do not have the AtHoc icon, enter https://warnings1.army.mil/SelfService/2026321 into your browser and you will be taken directly to the Self-Service login page. Step 2: Scroll slowly over the icon and the tag should read USAG Bavaria MWN. Step 3: Right click on the AtHoc icon and select Access My Self-Service from the pop-up menu. Step 4: Select the My Profile tab and update your basic information—first name; last name; rank/grade; primary duty location; organizational hierarchy; duty status, and include alerts from, all on-duty contact information (work phone, work email), and at least one off-duty contact device (phone and/or phone with text). The DEROS date field was recently added to help the garrison disable your account once you leave Europe. Step 5: It’s very important that all telephone numbers, DSN or civilian, are entered as if dialed from the United States, starting with 01149. For example, a work number in Grafenwoehr would look like this: 011499641837226. The AtHoc system is located in the United States and must dial you internationally. Do not add spaces, dashes, or precede 49 (Germany) with a plus symbol. Again, do not enter DSN numbers. If you are not sure about prefixes for your installation, see the USAG Bavaria Phonebook. Let’s back up — I don’t see the purple globe or the tag displays the wrong location. What do I do now? You can still register at the USAG Bavaria MWNS Self-Service page for your location. For Grafenwoehr and Vilseck: https://warnings1.army.mil/SelfService/2026321. You said something about a smartphone application? Step 1: Make sure you are registered with an active email address in the USAG Bavaria mass warning notification system. Step 2: Download the AtHoc Notifier app from the Apple or Google store. Step 3: When the download is complete, open the application and enter the DOD email address associated with your USAG Bavaria MWNS account. Step 4: AtHoc will send a verification email to confirm your address. From the email, click Verify Now. Step 5: Return to the application and add the USAG Bavaria MWN organization code: usa-bavaria. I’m a family member or a Retiree and don’t have a CAC. Can I register myself? Secondary population personnel for AtHoc include family members associated with the primary and tertiary population, retirees, guests, visitors, and other potentially impacted personnel. This does not include delivery or similar short term (less than 24 hours) visiting personnel. Family members can be registered by the primary and/or tertiary population personnel from their AtHoc self-registration page. Retirees can be registered and deregistered through their garrison retiree activity council or similar. Guests, visitors and other potentially impacted personnel can register through the visited organization. For questions about your profile or other account data, contact your unit or directorate AtHoc End User Manager (EUM). For garrison personnel, please contact the local garrison support staff. For Grafenwoehr or Vilseck, email usarmy.bavaria.imcom-europe.list.ioc@mail.mil. For technical questions — for example, you can see the AtHoc icon, but it is greyed out — you can also call the stateside Emergency Management Modernization Program (EM2P) help desk at DSN 312-867-3365 or toll-free from Germany 0800-184-4939.